The Primary School program fulfills the important learning goals of Keystone Academy by providing the social, emotional and intellectual building blocks that students need to flourish. The Keystone Academy model of integrated education develops students who show a passion for learning and are well prepared for secondary school. Each and every day of primary school is exciting; students are always confronting original ideas, meeting different kinds of challenges, cultivating new forms of knowledge, practicing different skills and learning in new ways. 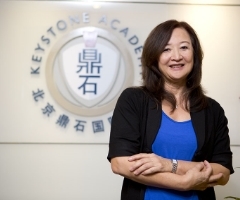 Keystone Academy Primary School uses a dual-language immersion program in which students study, play and learn throughout the school day using both Chinese and English. Keystone education introduces the value of learning in two languages, building a foundation of linguistic competency and cultural understanding. We employ a progressive model of language acquisition that is based on research and effective practice. Students from immersion programs demonstrate a high correlation between complex thinking skills and advanced linguistic abilities. They have excellent cognitive flexibility and problem-solving skills. Within the dual-language immersion model, the primary school uses the widely recognized International Primary Curriculum (IPC) to orient integrated learning for the foundation year through grade 5. The strength of this program comes from the consistent and well-organized emphasis on student learning. Learning goals are linked to knowledge, action and understanding; these goals are designed to orient teachers and students in their daily work on IPC units and guide them in assessment and evaluation. Both classroom teachers and neuroscientists support the kind of unified and connected understanding of complex issues used in the IPC model of learning – it makes learning fun and engaging for students as they confront challenging academic objectives. Language Arts classes in English and Chinese are important pathways for communication, imagination, creativity and critical thinking. The goals for Language Arts in both English and Chinese courses are to develop and nourish a love for reading, give students the confidence they need to explore literature as life-long learners, and provide the tools students need to communicate effectively in speaking and writing. Teachers introduce students to different genres (e.g., poetry, prose, drama, essays) in world literature in ways that make the learning of language, communication, and critical thinking purposeful, accessible and fun. Formal instruction in age-appropriate language mechanics and writing meanwhile helps children develop their literacy skills in both languages. Language Arts in Chinese follow the guidelines of the Chinese National Curriculum for native speakers, and other standards, including those developed at Keystone Academy, for Chinese language learners in order to ensure students gain the essential knowledge, key skills, and breadth of learning to attain native fluency. In the end, we know that effective preparation in the Language Arts boosts students’ performance in all their academic subjects. Rigorous understanding of Mathematics is also essential for success at Keystone Academy. Mathematics is taught both as a separate course and as integrated portions of the IPC units. The Keystone Mathematics program is designed to make it relevant to the everyday lives of our students, and to provide the foundational knowledge required for the advanced Math and Science in our secondary school International Baccalaureate (IB) programmes. Keystone Academy students use a research-based, results-oriented Math curriculum, which guides formal instruction of grade-level skills and concepts using an approach that combines the concrete, pictorial, and abstract approaches, leading children to deep understanding of mathematical concepts. Science education is essential and naturally engaging to students in primary years. Our program includes experiments, predictions, and hands-on learning experiences that generate great enthusiasm for learning. While scientific concepts and skills are integrated into IPC units, we also use a supplementary Science curriculum program to enrich the learning experiences of our students in this subject area. Technology is a pervasive fact of life for our children today. Primary school teachers guide students through appropriate and progressively more sophisticated use of computing devices. Students have direct and daily access to technology through a well-integrated two-to-one computing environment, using tablets and computers. We use technology both as a tool to facilitate learning in other disciplines and as a subject of study in its own right. Physical Education and Wellness are essential components of the educational process for students at Keystone. Starting in primary school, students practice wellness through an integrated program of exercise and nutrition that blends the best of Eastern and Western fitness traditions. Our new facilities allow us to offer a wide variety of athletic activities, including programs in wushu and swimming. Full integration of the Arts engages primary students, makes their learning visible, and generates real passion for learning. At Keystone we place great emphasis on all the arts, linking them thematically to the integrated IPC units and to Chinese cultural history. In our music rooms and art studios, Keystone Primary School students work independently and collaboratively to explore and investigate music and art history, ceramics and sculpture, drawing, painting and calligraphy. Global competency is a key theme running throughout the ethos of Keystone Academy; our students are well informed and closely connected to their own communities as well as communities in other parts of the world. Our students gain deep understanding of Chinese history and the situation of China in the world today, comparing this rich cultural tradition to other important traditions across the world. The IPC units are anchored in daily Global Social Studies classes and are thematically linked to the other disciplines. Our comprehensive Primary School program addresses the intellectual, social, emotional and physical development of children, and prepares them for a smooth and harmonious transition to the middle and high schools. Ms. Fan Pan has worked in education for 20 years. 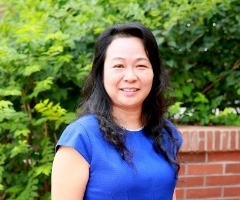 She has extensive experience in teaching Chinese in primary school, in primary school administration as well as teacher training.